Approach: Follow the Ghost River driving directions to Devils Gap. Hike up the valley for about 15 or 20 minutes to the first canyon on the right just as you reach the first Ghost Lake. 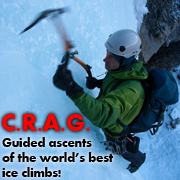 Go up the canyon climbing a couple of short easy ice steps and one pitch of W2 until reaching Aquarius. Alternately, climb the WI3 route “Sunshine” which is on the same cliff band as Malignant Mushroom but a fair ways further up the valley, and then hike up and left through the forest to reach Aquarius. 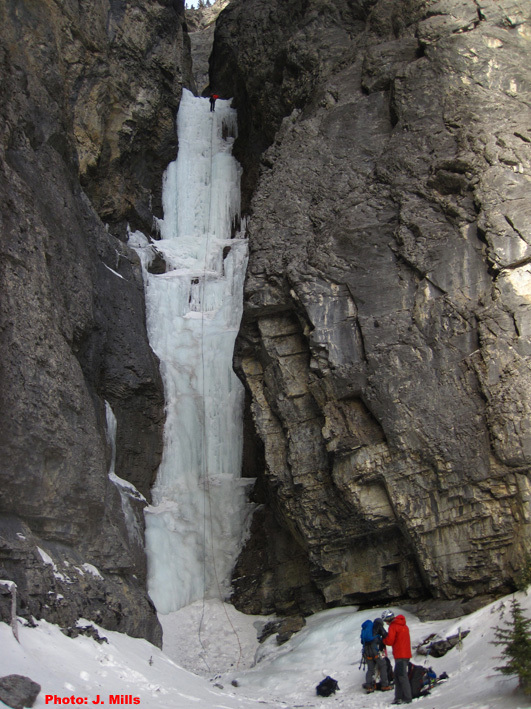 Route Description: A nice 60m pitch of often wet ice leads to a bolted belay on the right wall at the entrance to the incredible “Recital Hall”. Even if you don’t plan on climbing the routes above, it’s worth walking the few steps above the anchor to check out Fearful Symmetry & Rainbow Serpent. Descent: Rappel from a bolted station. Objective Hazards: Some rockfall hazard on very windy days.